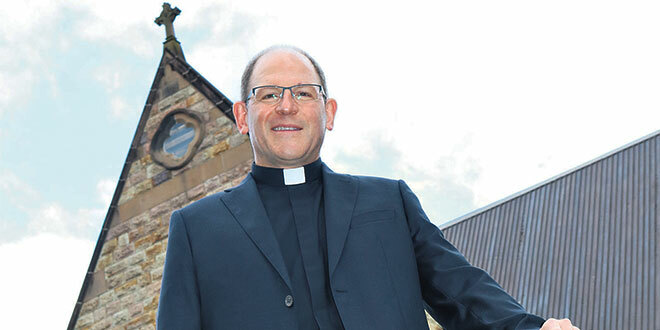 FORMER Holy Spirit Provincial Seminary rector Monsignor Anthony Randazzo said it was “inspirational” to be named one of two new auxiliary bishops for Sydney archdiocese. Msgr Randazzo, 49, had just finished celebrating Mass in Brisbane’s St Stephen’s Cathedral when he received a phone call from apostolic nuncio Archbishop Adolfo Tito Yllana. “I was overwhelmed. But I told him I was available,” the bishop-elect said. Msgr Randazzo will join New Zealand-born Opus Dei priest Fr Richard Umbers as Sydney’s new auxiliary bishops alongside Bishop Terry Brady. Sydney Archbishop Anthony Fisher said the new appointees would bring intelligence, energy and pastoral skills to the Church in Sydney and to Australia’s “bench of bishops”. Msgr Randazzo, who worked for Pope Benedict XVI at the Congregation for the Doctrine of the Faith, was quick to share news of his appointment with his parents in the Surfers Paradise parish, on the eve of their 56th wedding anniversary. “Like me they were overwhelmed and full of joy. They are amazingly faith-filled people,” Msgr Randazzo said. Msgr Randazzo will bring to the role of auxiliary bishop a passion for vocations nurtured during his seven years as rector of Queensland’s Holy Spirit Provincial Seminary during which he oversaw the ordination of 27 priests and five deacons. Finishing the role last December, he took sabbatical leave, travelling first to Rome and then Jerusalem, where he undertook studies in sacred scripture with the Sisters of Notre Dame de Sion. Msgr Randazzo has degrees in theology from the Brisbane College of Theology and in canon law from the Pontifical Gregorian University in Rome. While his recent work has centred on formation of priests at the seminary, he stressed the importance of formation for Christians across all vocations. “God calls some people to be married, God calls other people to remain single, God calls some people to consecrate their lives in religion, God calls other people to become priests, or deacons, or bishops,” he said. “When you are baptised, God’s Holy Spirit is poured out into your heart, and God through the Holy Spirit gives you gifts. They are the most wonderful gifts, and God never takes those gifts back. “When you are confirmed the Holy Spirit breathes into you once more and animates those gifts so that you can use them not just for yourself but for others, because that is what being a Christian is all about. Msgr Randazzo was born in Sydney and baptised at Mater Dei Church, Blakehurst. He grew up in Coolangatta and considers himself a Queenslander. He graduated with a Bachelor of Theology from Brisbane College of Theology in 1991 and was ordained a priest the same year. About leaving Brisbane and Queensland, he said he drew on a gem of wisdom imparted to him by a Canossian Sister and missionary who once gave him counsel when he was leaving his family to study in Rome. “She asked me, ‘Do you love them?’ And I said yes,” Msgr Randazzo said. “She asked: ‘And so they are in your heart?’, ‘Yes’, I said. “She said: ‘So wherever you go they will be with you because they are deeply in your heart’. The second appointment to Sydney, Fr Umbers, 45, is a priest of the Prelature of Opus Dei and tutor at the University of Notre Dame. Their appointments followed the transfers to new dioceses of former auxiliaries Bishop Peter Comensoli and Archbishop Julian Porteous, and the five-month absence due to illness of the Archbishop Fisher. “Very intelligent, energetic and pastoral men are joining the bench of bishops in Australia and the leadership team here in Sydney, and the priests and people of Sydney will welcome them with open arms,” Archbishop Fisher said. Brisbane Archbishop Mark Coleridge, in a message to the clergy, religious and lay faithful of the archdiocese said “we in Brisbane join as one in praising God and congratulating Anthony” on his appointment. “He will be much missed in the archdiocese where he has given fine priestly service through the years and in the Province of Queensland which he has served so well as rector of Holy Spirit Seminary in more recent times,” Archbishop Coleridge said. “But the Church is bigger than the archdiocese, and so we offer him gladly for his new ministry in Sydney. “Monsignor Randazzo is no stranger to service in other climes. He was called from Brisbane to serve the Holy See in the Congregation for the Doctrine of the Faith, and he managed that shift with faith and generosity, energy and love of the Church. “Those same gifts will help him make this new shift not only to the episcopate but to the Archdiocese of Sydney. “He has moved far from Brisbane and does so again now. But he will always remain one of ours and will take south the many graces of this archdiocese, a child of Sydney which now returns one of its own for service there. The episcopal ordination of Msgr Randazzo and Fr Umbers will take place at St Mary’s Cathedral, Sydney, on August 24 – an important date for the Randazzo family. “It’s the Feast of St Bartholomew which is a significant thing in my family who come from the Italian island of Lipari, because St Bartholomew is the patron saint (there). I think that is a happy grace,” he said. Next: We asked Queensland MPs what they think about Rob Pyne’s abortion bill. Here’s the verdict.